Light And Life In A Babraham Orangery. 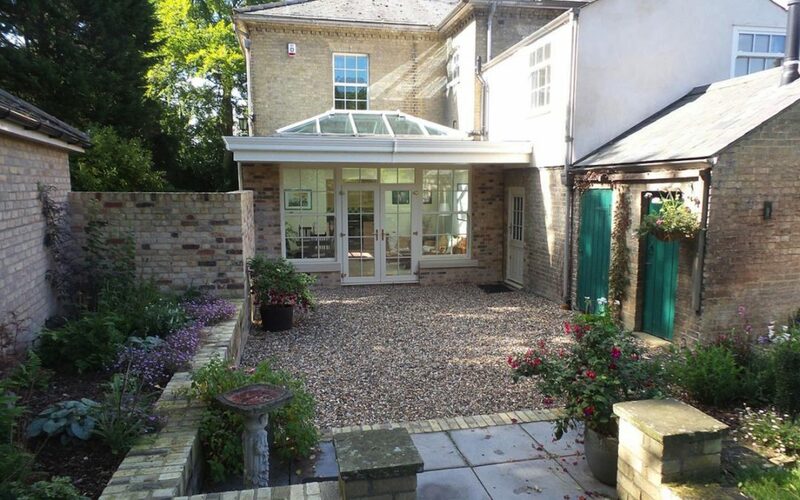 When the owners of this beautiful property in Babraham were undertaking the complete renovation of their home they knew they wanted to change the way they lived in their home by adding a glass extension. There were a few things on their wish list and they needed a bespoke solution that would enable them to achieve everything they wanted. A visit to the Cambridge Conservatory Centre for advice was the first step. 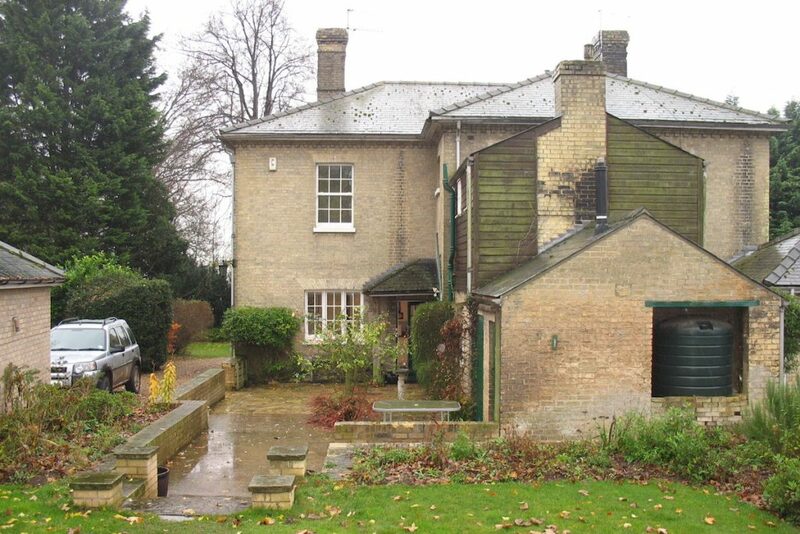 As you can see in the image below, the main house had been added on to over the years and the rear of the property was comprised of various additions that needed refurbishment. The positioning of them created a good sized L-shaped patio space which would provide ample space for a new extension. The owners had plans to revitalise the exterior of the property which included stripping off the wooden cladding on the upper level of the existing extension and replacing it with a white rendered finish instead. This would lighten the whole look of the property and give it a new lease of life. And they wanted to continue the light, airy and bright feeling into their new kitchen extension. Together we designed a gorgeous bespoke Babraham Orangery that gave the family everything they asked for. The existing back entrance was used by the family every day so it was important to create access to the new room in a similar way. And as part of their renovations, a new door was to be added where there was currently a window. 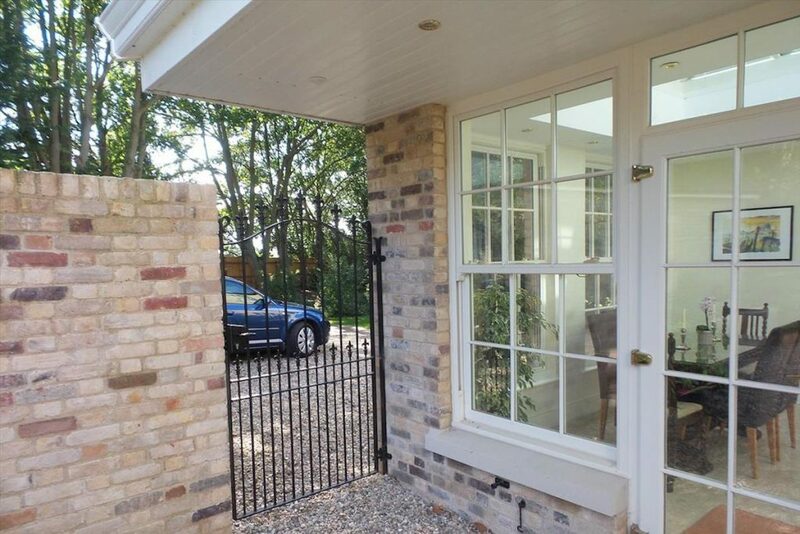 To provide shelter from the weather for people using this door as well as the doors to the new Babraham orangery, we designed a wide overhang to sit along the front of the new room. As there are no support posts, the overhang appears to float. This is achieved by cantilevering the overhang from the main building. We replicated the hipped roof line, the sliding sash windows and chose a brick that would weather in time to match the existing brick of the house. The light, airy space the owners wanted has been delivered in spades. From the inside the orangery is light and spacious and the gorgeous traditional windows allow the view beyond the orangery to be framed perfectly. And for anyone arriving at this stunning property, the approach to the orangery is hugely inviting. Light splays out from the windows, a beautiful wrought iron gate offers a sense of occasion and on days when the English weather is unforgiving, shelter is found under the generous overhang. 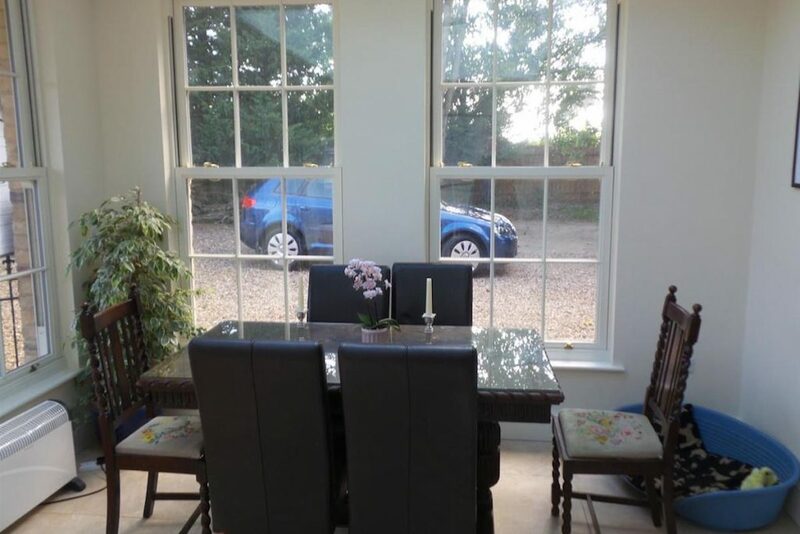 This Babraham Orangery has enhanced this property, delighted it’s owners and we just love it!